Some, if not all of you are probably watching HBO’s adaptation of George R.R. Martin’s fantasy magnum opus A Song of Ice and Fire (aka Game of Thrones). I, being the poser/purist that I am, have been reading the books instead, mainly so that I can read the original story and then complain about how the TV adaptation screwed everything up. I’m enjoying it so far, and I’m about 25% of the way through the last book that has been published (A Dance with Dragons). 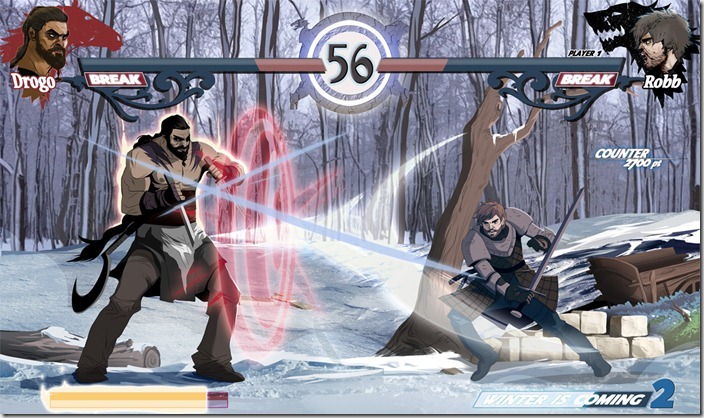 Which got me thinking about whether Game of Thrones would make good fodder for a fighting game or not. It goes without saying that combat figures heavily in the story, although it tends to be of the army vs. army variety rather than one-on-one. In addition, while there are a few characters who use signature weapons, there really aren’t anything in the way of ‘signature moves’ like you might expect in your average shounen manga. There are also plenty of characters who wouldn’t wield a weapon for any reason (like perhaps 90% of the female cast), so clearly some improvisation will be necessary. Robb Stark – a straightforward character who uses ice-based attacks (I know he doesn’t use Ice, shut up) and can summon his direwolf Grey Wind to do some attacks for him. Jon Snow – Seemingly cut from the same mould as Robb with a direwolf (Ghost) to match, but tilted a bit more to the defensive side of things. Might help to think of Robb and Jon as the Ryu and Ken of the game, maybe? Brienne of Tarth – a close range character who relies heavily on speed and mixups due to her speed. Gregor Clegane – aka The Mountain. The game’s resident ‘big guy’ who relies on powerful normals and hard-hitting special attacks to dish out damage. His power is of course offset by his speed. Tyrion Lannister – now before you start laughing, I don’t intend for Tyrion to be fighting on his own – cast your mind back to Chang and Choi in CvS2, or even Carl Clover in BlazBlue. The idea here is that Tyrion and his sellsword Bronn are playable as a unit, with each character being able to move independently through special button inputs. Jaime Lannister – couldn’t go without him, obviously, although having him in the game post-hand removal might make for a more interesting play style. Alternatively (or additionally), put in Loras Tyrell so you can go nuts with the flower effects. Melisandre – Fire. Lots of it. The game’s zoning character. Thoros of Myr – More fire. Except this time on a sword. Since Thoros’ gimmick in the books is that he lights his sword on fire to strike fear into his enemies, he might work well as a character with a ‘powerup’ mode where his sword bursts into flames. He might even be able to call on the members of his Brotherhood without Banners like Anguy and Tom Sevenstrings for some of his moves. Either Oberyn Martell or Areo Hotah – the former is seen using a spear in the books, the latter a poleaxe. Either would be well suited to the role of a ranged/poking character a la Billy Kane from Fatal Fury/KOF. There are some wrinkles – for instance some characters are dead before they would normally have had the chance to meet some of the others on my above roster, and some factions aren’t really that well-represented (Pretty much no-one east of Westeros, for instance). But if anyone has any other ideas, do post them in the comments! Not that I’ll be able to do anything with them…but it might make for some interesting discussion. This is a fun idea. I’m not much into fighting games, but I like seeing how characters from Game of Thrones would work in such a setting. – Arya (how could you forget her!?) should definitely be on the list, she is small and quick and her sword style is more the fencing variety. – Daenerys using her dragons somehow would probably work. – The Hound whose major weakness is fire would also be interesting against fire based characters. – Robert who is more of a brawler than a swordsman would add variety. – Drogo who was already in the image.